Looking for a great HOLIDAY? Want to relax and enjoy doing something Different? Do you like the idea of train travel ...mixed with fun? Want to see ALL of Vietnam? 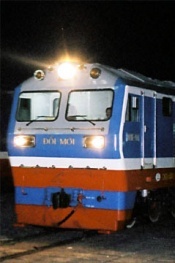 There are many ways to see Vietnam as you travel from the Mekong Delta in the south to the Red River Delta and Chinese Border in the far north (or vice-versa), but no better way than by train. NOT just any train, but a train with our own specially prepared and staffed, private charter carriages that stay with us throughout the journey. This tour is UNIQUE. 18 adventure-filled days taking in the history, sights and charms offered by this beautiful country and it’s hard-working, friendly people. Experienced guides, good hotels, fantastic food, great entertainment, and sensational shopping ensures everyone is programmed to fully enjoy this once in a lifetime experience. RAIL TOUR PRICES (not incl airfare). 18 Day Tours in 2018 are priced from *$3750 pp/ts (Standard). Superior Tour is *$4000 pp/ts. *Option of 5 Star hotels on Rail Tour ...from *$5350 pp/ts. Single Supplement cost is $705.00 (Single traveler/single occupancy hotel room/4 Star hotel), or $1200.00 in 5 Star hotels. Day 16. Arrive in Hanoi, farewell our friendly rail crew, then transfer to coach for trip to Ha Long Bay ...brekky stop enroute. All aboard our JUNK for the start of a relaxing boat cruise around the islands and grottoes of this World Heritage attraction. Spend a day & night aboard our JUNK and enjoy wonderful seafood for lunch and dinner ...great dining! B/L/D. Day 18. Morning free for final shopping before Hotel-Airport transfer.